Going into the theater, I thought that I knew what to expect from “Shazam!” It would be a silly, lighthearted superhero flick. It would feature a great leading performance from Zachary Levi, a wonderfully goofy actor whose work I’ve admired since the later 2000s when he starred in the TV series “Chuck.” I expected, in other words, a pretty fun time at the movies. And to a large extent, I received exactly that. But, late into the film, I was caught completely off guard. It veered into surprisingly heavy territory, bluntly addressing the kind of themes and conflicts that kids’ movies usually sugarcoat or avoid entirely. I won’t say much about what actually happens; to do so would spoil a terrific scene. It’s a shocking moment, both for being a surprise plot twist, and for the emotionally intense territory it enters. I will say this: I cried. Yes, during a movie so silly, and so aware of its own silliness that it features an exclamation point in its title, I was moved to tears. To be clear: My tears say more about the movie than they do me. “Shazam!” is, on some level, exactly what I expected: A delightful, funny, superhero movie. It’s also a deeply moving and thoughtful story about a subject Hollywood usually botches by artificial sentimentality: Family. The story follows Billy Batson (Asher Angel), a troubled teenage orphan living in Philadelphia. When he was a young child, his mother lost sight of him at a crowded carnival. Since then, he’s been searching for his lost biological mother while hopping from foster home to foster home. He’s placed in a new foster home with a warm and loving family, and a potential friend in the form of Freddy Freeman (Jack Dylan Grazer). Shortly after defending Freddy from school bullies, Billy is magically whisked off to the lair of a dying wizard (Djimon Hounsou). Searching for a new heir, the wizard offers to bestow his powers upon Billy. All Billy has to do, in turn, is utter the wizard’s name: Shazam. (The film, to its credit, is just self-aware enough to make fun of this profoundly silly name). When he does, Billy finds himself in the body of a muscular, adult superhero (Levi), with a grab bag of powers. By repeating the wizard’s name (Shazam! ), he can switch between this adult body and his regular self. From there, the story follows many of the same beats as other superhero origin stories, but with a smart mix of schmaltzy sentimentality and goofy humor. Credit must be given to screenwriter Henry Gayden, who enlivens clichés with relatable humor. While he may look like a grown adult, Billy, in his superhero form, is still a child. Consequently, he acts like any kid would, if suddenly granted powers. Freddy records Billy’s attempts to figure out and understand his powers, and (in a particularly entertaining montage), uploads them to Youtube. They buy beers, enter strip clubs, and do a whole host of other things that kids aren’t allowed to do. The film is fulfilling a requirement of every superhero origin story–that moment where the hero experiments with and learns about their powers–but does so with an entertaining twist; the superhero is a child, living out his fantasy of being an adult. The other origin story cliché that the film enacts, less successfully, is that of the villain. Theoretically, the film has a perfect antagonist in Thaddeus Sivana. Like Billy, he too has a rough relationship with his family; in his case, his aggressive and mean-spirited father and brother. As a child, he too was sent to Shazam’s lair, but denied powers, as he failed to demonstrate his purity of heart. Now, as a grown adult, he seeks the magical abilities he was denied as a child through villainous means. In other words, he should be the perfect foil to Billy: suffering through similar traumas which shape them in different ways. In practice, however, Sivana is one-note mediocrity in writing and performance. The script never allows Sivana to show any real emotion, any of the pain simmering over the course of his life. Mark Strong’s performance doesn’t alleviate the problem, either. Strong leans into the soulless anger of his character so much that Sivana becomes just another angry bad guy for the hero to eventually defeat, with no inner life to call his own. Sivana, fortunately, is the exception and not the rule. The rest of the cast and characters are excellent. Levi, as mentioned, is fantastic. He builds off of the performance ticks he honed years back in “Chuck.” There, he played a bit of a man child who has a super computer embedded into his mind; now, he plays an actual child given actual superpowers. The transition is seamless: Levi fully captures the glee and terror Billy experiences over his newfound alter ego. As the young Billy, Asher delivers a solid performance, bringing a weighty angst to the character, though one can’t help but wish that he was a little goofier to match Levi’s performance. Yet the film’s true standout is not Levi, but Dylan Grazer. Freddy’s a lovable person who’s ignored and bullied by his classmates due to his disability, and, appropriately, Dylan Grazer brings a mix of beaming charisma and quiet loneliness to the role. He’s more than Billy’s sidekick; he’s the movie’s scene stealer. The relationship between Billy and Freddy, two foster family brothers, provides a solid backbone. This is a film that isn’t subtle in its messaging about family. It begins with Sivana in conflict with his family members, then segues into Billy’s own troubles with his missing mother and the many times he’s fled foster homes. There are visual callbacks throughout the film to Billy losing his mother, including a third-act final battle set at a carnival. It’s pretty rare that a superhero movie’s climactic action is entertaining; usually, it’s just a bunch of bombastic CGI effects and loud sound effects. But “Shazam!” avoids this trap, grounding its finale in the film’s main theme. One moment at the carnival may or may not have brought me to tears a second time. 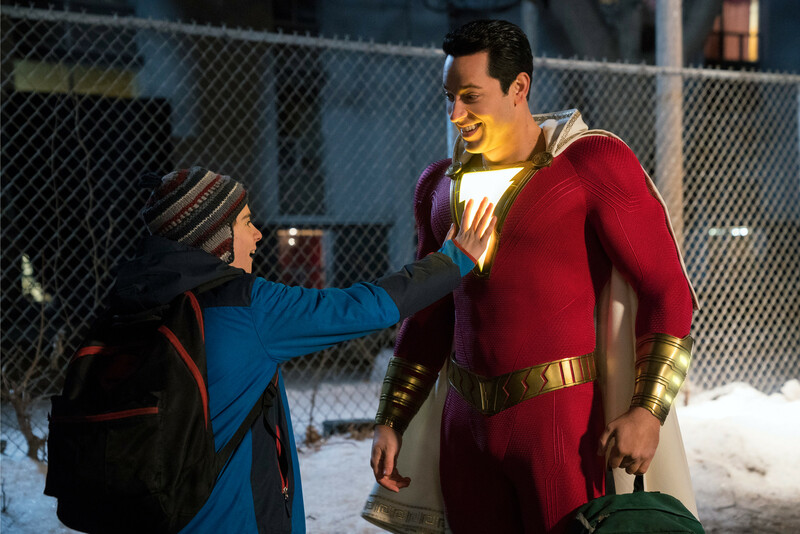 “Shazam!” is as silly a movie as one would expect, but it’s also an emotionally smart film. In approaching the topic of family, it doesn’t shy away from darker, discomforting truths, nor does it avoid wearing its heart on its sleeve. It’s a cheesy, schmaltzy movie, but it works all the same. More than its protagonist’s powers, the film’s thoughtful re-imagining of tired clichés is its real magic.